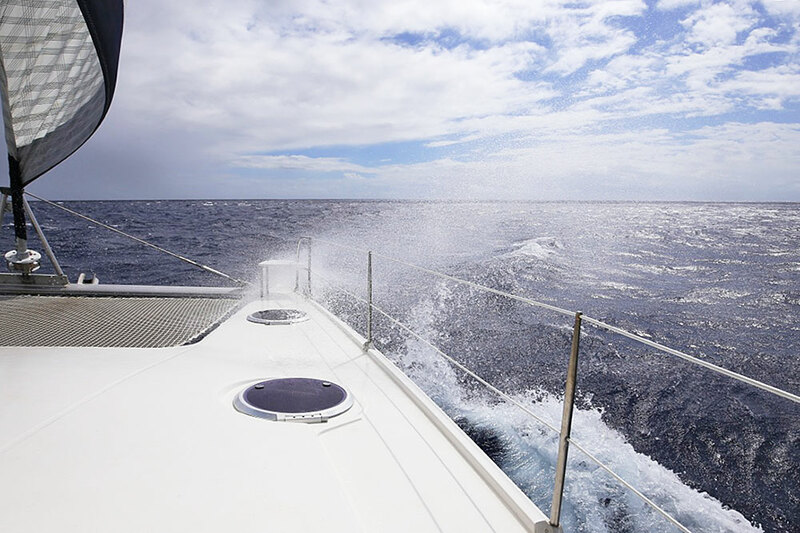 On rounding Cape Santa Maria toward the east, we spot the approaching squall. Departed this morning at 8 A.M. And motor-sailed the three miles north to the head of Long Island. The forecast northeast wind of under 20 knots was still northeast but was much stronger, blowing across a sea of six to eight foot waves. Our intention was to have enjoyed a gentlemanly beam reach down the east side of Long Island to Clarence Town Harbour, but nature had a different plan. The weather we met down the east side of Long Island consisted of tempestuous winds gusting up to 35 knots and an unending sequence of nasty squalls full of wind-driven cold lashing rain. Dashing over the choppy waves, Destiny several times reached a speed of 12 knots! We arrived at Clarence Town soaked. Captain Dave and Josiah before being drenched by the squalls sailing south down the inhospitable east coast of Long Island. Admiral Morison asserted that the mangrove choked waters behind Newton Cay at the northern end of Long Island was Columbus’s shallow “marvelous harbour” with two mouths. Newton Cay begins eastward at an indentation largely dry at low water called euphemistically East Harbour. This is one mouth of Columbus’s “marvelous harbour” as interpreted by Morison, which has a length of not less than two nautical miles behind hilly Newton Cay. The western mouth is what Morison called Santa Maria Harbour and is where your writer received his black eye. Both our captains agreed that in the absence of a chart it would be impossible to see that the two mouths were connected. Possibly Columbus learned that it was possible to canoe from one mouth to another from the two San Salvador natives he kept on Santa Maria, but it is certain that he could not have seen the connection himself. Admiral Morison posited in 1942 that Columbus’s fleet hove-to east of Burnt Ground the night of 16 October and anchored there the morning of the 17th. In 1963, he added a possible anchorage east of the settlement of Simms as an alternative to this. Our two captains judged the first premise “absurd” with its hard rocky bottom and profusion of reefs, and noted that the second was too far south to have allowed Columbus to make the explorations he recorded on the 17th. Finally, the Morison route requires that Columbus navigate at night to windward of a largely unknown coast to arrive at Little Harbour toward the southern end of Long Island. 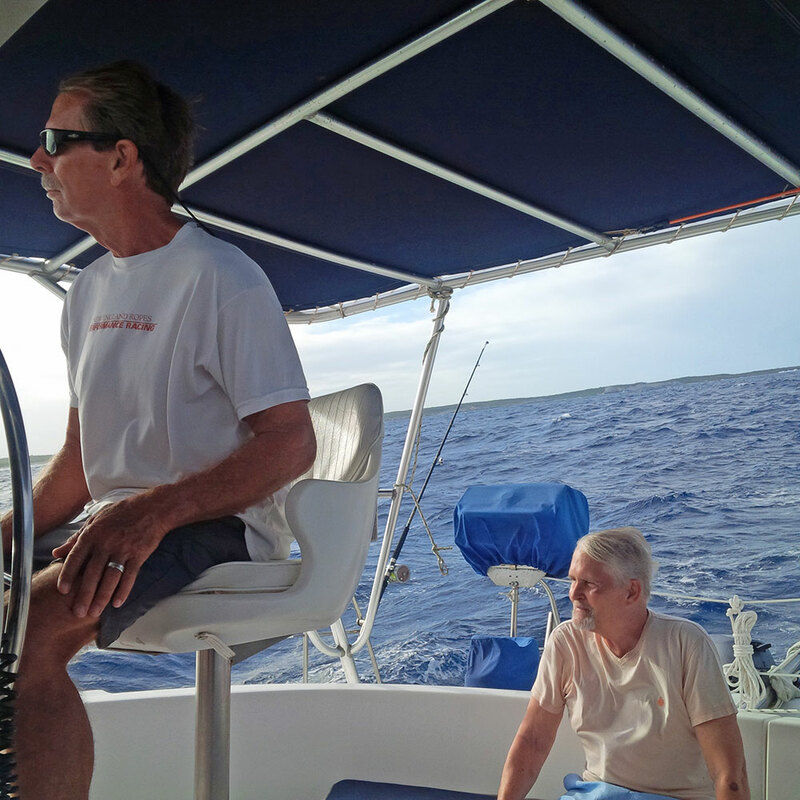 Captains Dave and Tim consider this a dangerous choice for a fleet thousands of miles from home among uncharted islands. Weather permitting, we intend to examine Little Harbour tomorrow.